The Cappella degli Scrovegni in Padua, Veneto, Italy (also known as the Arena Chapel) is regarded as one of the masterpieces of Western Art. It was commissioned in 1300 by Enrico Scrovegni as penance for the sins of his father Reginaldo. It is known as the Arena Chapel as the site it is built on was that of a Roman arena. The building was completed in 1303 and Scrovegni commissioned Giotto to decorate the interior in fresco- a project completed around 1305. The frescoes in the Arena Chapel depict scenes from the lives of St Joachim and St Anne and the Virgin, and from the Life and Passion of Christ. These frescoes, the masterpiece on which the whole modern concept of his style is based, are unsigned and undocumented, as are those in the Bardi and Peruzzi Chapels (Life of St Francis and Lives of Sts John Baptist and Evangelist) in Santa Croce, which are generally accepted as the only reasonable foundation for an idea of his stylistic evolution during his maturity. The youth of Christ and the story of his Passion are narrated on the two lower registers of the wall of the Scrovegni Chapel. 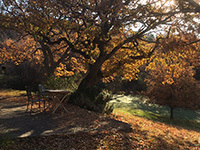 The scheme has 100 major scenes with the heavily sculptural figures set in compressed but naturalistic settings often using forced perspective devices. Giotto's major innovation was to conceive of a painted architectural framework or grisaille using trompe-l'oeil effects that directly influenced Masaccio and in turn Michelangelo in his scheme for the Sistine Chapel. Famous panels in the series include the Adoration of the Magi in which a comet like Star of Bethlehem streaks across the sky and the Flight from Egypt in which Giotto broke many traditions for the depiction of the scene. The scenes from the Passion were much admired by artists of the Renaissance for their concentrated emotional and dramatic force, especially the "Lamentation over the Dead Christ", and studies of the sequence by Michelangelo exist. The Ognissanti Madonna now in the Uffizi and the sole surviving major panel work by the artist also dates from this period. In spite of his fame and the demand for his services, no surviving painting is documented as being by him. His work, indeed, poses some formidable problems of attribution, but it is universally agreed that the fresco cycle in the Arena Chapel at Padua is by Giotto, and it forms the starting-point for any consideration of his work. The Arena Chapel (so-called because it occupies the site of a Roman arena) was built by Enrico Scrovegni in expiation for the sins of his father, a notorious usurer mentioned by Dante. It was begun in 1303 and Giotto's frescos are usually dated c. 1305-06. They run right round the interior of the building; the west wall is covered with a Last Judgement, there is an Annunciation over the chancel arch, and the main wall areas have three tiers of paintings representing scenes from the life of the Virgin and her parents, St Anne and St Joachim, and events from the Passion of Christ. Below these scenes are figures personifying Virtues and Vices, painted to simulate stone reliefs — the first grisailles. The figures in the main narrative scenes are about half-size, but in reproduction they usually look bigger because Giotto's conception is so grand and powerful. His figures have a completely new sense of three-dimensionality and physical presence, and in portraying the sacred events he creates a feeling of moral weight rather than divine splendor. He seems to base the representations upon personal experience, and no artist has surpassed his ability to go straight to the heart of a story and express its essence with gestures and expressions of unerring conviction. The cathedral in Sansepolcro contains a gilded polyptych of the Resurrection (14th century), attributed to Niccolo di Segna. 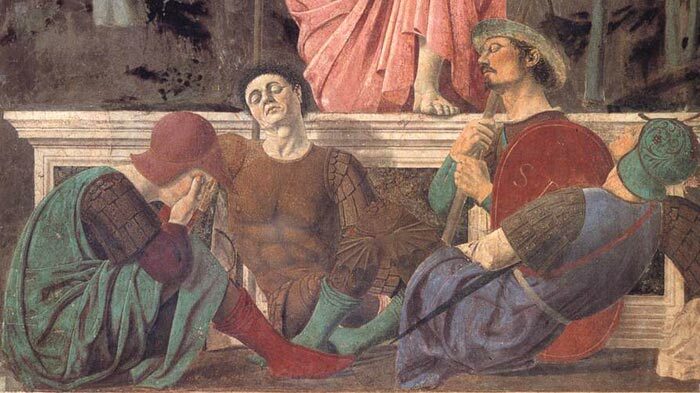 The central figure of Christ stands in a pose so similar to Piero della Francesca's Ressurection in the Museo Civico, that many feel della Francesca must have studied this first. Niccolo di Segna began his career in the workshop of his father, Segna di Buonaventura. He followed the style of Duccio with a greater rigidity of the forms. He was also influenced by Simone Martini as seen in the Crucifixion (1345, Pinacoteca Nazionale, Siena) and in the frescoes attributed to him (S. Colomba a Monteriggioni near Siena). 'In Piero's work the relationship between divinity and humanity is expressed with figurative solutions which are related either to a still Medieval type or portrayal, or to a "modus operandi" open to the new trends. 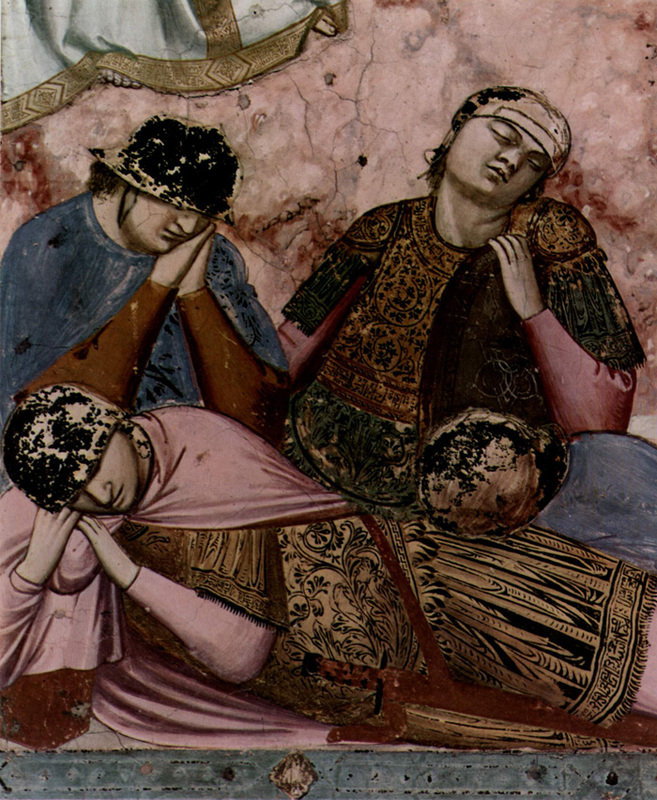 In the central panel of the Polyprych of the Misericordia (see page 19), the figure of the Virgin is much bigger than the figures of the donors beneath her cloak. This is entirely in keeping with the Medieval model that resolved the divine-human relationship in dimensional terms, as we can see in the two fourteenth century paintings shown here. Andrea del Castagno (1423-1457) was born in a village in the Mugello area near Florence now called Castagno d'Andrea, and was probably trained in Florence. He was well known for the emotional expressionism and naturalism of his figure style. Castagno's first noteworthy paintings were executed for the Florentine convent of Sant' Apollonia. In this fresco cycle of 1447 Castagno depicted scenes from the Passion of Christ and the Last Supper, works influenced by the pictorial illusionism of Masaccio. The presence in Florence of Domenico Veneziano – who, assisted by Piero della Francesca, worked in the church of Sant'Egidio (1439-1445) – was probably decisive for Andrea. Even without giving credence to Vasari's story about Andrea's envy of Domenico, he was certainly influenced by the latter's clear, luminous palette and rigorous perspective constructions, with solutions often very near to or foreshadowing those of Piero della Francesca. The obvious analogies between this fresco, the Resurrection, and the same subject painted several years later by Piero della Francesca in Borgo San Sepolcro has been the object of many critical studies. The simplicity and the perfect perspective composition of the fresco in Sant'Apollonia is considered by some scholars an anticipation of the art of Piero, whereas others think that it is rather a reflection of it. Giotto di Bondone was a Florentine painter and architect. Outstanding as a painter, sculptor, and architect, Giotto was recognized as the first genius of art in the Italian Renaissance. Giotto lived and worked at a time when people's minds and talents were first being freed from the shackles of medieval restraint. He dealt largely in the traditional religious subjects, but he gave these subjects an earthly, full-blooded life and force. The artist's full name was Giotto di Bondone. He was born about 1266 in the village of Vespignano, near Florence. His father was a small landed farmer. Giorgio Vasari, one of Giotto's first biographers, tells how Cimabue, a well-known Florentine painter, discovered Giotto's talents. Cimabue supposedly saw the 12-year-old boy sketching one of his father's sheep on a flat rock and was so impressed with his talent that he persuaded the father to let Giotto become his pupil. Another story is that Giotto, while apprenticed to a wool merchant in Florence, frequented Cimabue's studio so much that he was finally allowed to study painting. The earliest work attributed to Giotto is a series of frescoes on the life of St Francis in the church at Assisi. In about 1305 and 1306 Giotto painted the extraordinary series of frescoes in the Arena Chapel in Padua. Vasari tells the story of how Pope Boniface VIII sent a messenger to Giotto with a request for samples of his work. Giotto dipped his brush in red and with one continuous stroke painted a perfect circle. He then assured the messenger that the worth of this sample would be recognized. When the pope saw it, he "instantly perceived that Giotto surpassed all other painters of his time." In Rome, Naples, and Florence, Giotto executed commissions from princes and high churchmen. The Peruzzi and Bardi chapels in the Church of Santa Croce are adorned by Giotto's frescoes. In 1334 the city of Florence honored Giotto with the title of Magnus Magister (Great Master) and appointed him city architect and superintendent of public works. In this GIOTTO di Bondone (b. 1267, Vespignano, d. 1337, Firenze) capacity he designed the famous Campanile (bell tower). He died in 1337, before the work was finished. Giotto was short and homely, and he was a great wit and practical joker. He was married and left six children at his death. Unlike many of his fellow artists, he saved his money and was accounted a rich man. He was on familiar terms with the pope, and King Robert of Naples called him a good friend. In common with other artists of his day, Giotto lacked the technical knowledge of anatomy and perspective that later painters learned. Yet what he possessed was infinitely greater than the technical skill of the artists who followed him. He had a grasp of human emotion and of what was significant in human life. In concentrating on these essentials he created compelling pictures of people under stress, of people caught up in crises and soul-searching decisions. Modern artists often seek inspiration from Giotto. In him they find a direct approach to human experience that remains valid for every age. In spite of his fame and the demand for his services, no surviving painting is documented as being by him. His work, indeed, poses some formidable problems of attribution, but it is universally agreed that the fresco cycle in the Arena Chapel at Padua is by Giotto, and it forms the starting-point for any consideration of his work. The Arena Chapel (so-called because it occupies the site of a Roman arena) was built by Enrico Scrovegni in expiation for the sins of his father, a notorious usurer mentioned by Dante. It was begun in 1303 and Giotto's frescos are usually dated c. 1305-06. They run right round the interior of the building; the west wall is covered with a Last Judgment, there is an Annunciation over the chancel arch, and the main wall areas have three tiers of paintings representing scenes from the life of the Virgin and her parents, St Anne and St Joachim, and events from the Passion of Christ. Below these scenes are figures personifying Virtues and Vices, painted to simulate stone reliefs - the first grisailles. 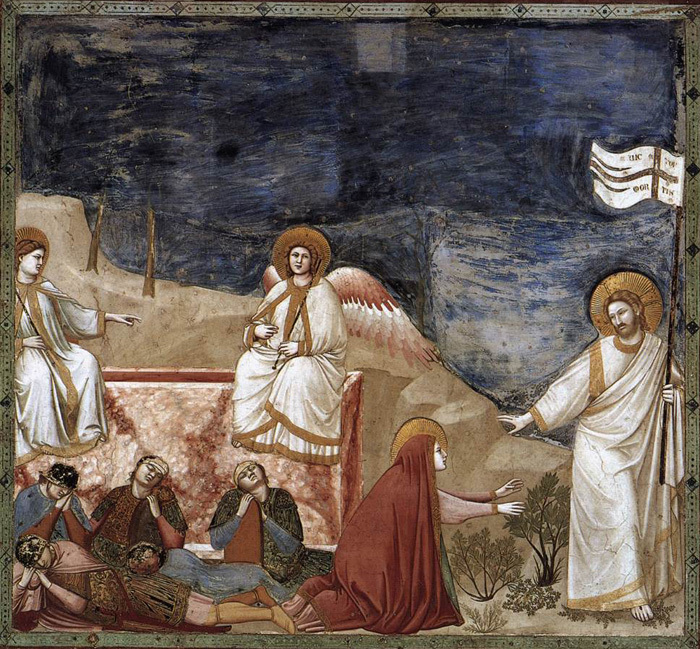 The figures in the main narrative scenes are about half-size, but in reproduction they usually look bigger because Giotto's conception is so grand and powerful. His figures have a completely new sense of three-dimensionality and physical presence, and in portraying the sacred events he creates a feeling of moral weight rather than divine splendor. He seems to base the representations upon personal experience, and no artist has surpassed his ability to go straight to the heart of a story and express its essence with gestures and expressions of unerring conviction. The other major fresco cycle associated with Giotto's name is that on the Life of St Francis in the Upper Church of S. Francesco at Assisi. Whether Giotto painted this is not only the central problem facing scholars of his work, but also one of the most controversial issues in the history of art. The St Francis frescos are clearly the work of an artist of great stature (their intimate and humane portrayals have done much to determine posterity's mental image of the saint), but the stylistic differences between these works and the Arena Chapel frescos seem to many critics so pronounced that they cannot accept a common authorship. Attempts to attribute other frescos at Assisi to Giotto have met with no less controversy. There is a fair measure of agreement about the frescos associated with Giotto in Santa Croce in Florence. He probably painted in four chapels there, and work survives in the Peruzzi and Bardi chapels, probably dating from the 1320s. The frescos are in very uneven condition (they were whitewashed in the 18th century), but some of those in the Bardi Chapel on the life of St Francis remain deeply impressive. Nothing survives of Giotto's work done for Robert of Anjou in Naples, and the huge mosaic of the Ship of the Church (the Navicella) that he designed for Old St Peter's in Rome has been so thoroughly altered that it tells us nothing about his style. In Rome he would have seen the work of Pietro Cavallini, which was as important an influence on him as that of his master Cimabue. Several panel paintings bear Giotto's signature, notably the Stefaneschi Altarpiece (Vatican), done for Cardinal Stefaneschi, who also commissioned the Navicella, but it is generally agreed that the signature is a trademark showing that the works came from Giotto's shop rather than an indication of his personal workmanship. On the other hand, the Ognissanti Madonna (Uffizi, Florence, c. 1305-10) is neither signed nor firmly documented, but is a work of such grandeur and humanity that it is universally accepted as Giotto's. Among the other panels attributed to him, the finest is the Crucifix in Sta Maria Novella, Florence. On account of his great fame as a painter, Giotto was appointed architect to Florence Cathedral in 1334; he began the celebrated campanile, but his design was altered after his death. In the generation after his death he had an overwhelming influence on Florentine painting; it declined with the growth of International Gothic, but his work was later an inspiration to Masaccio, and even to Michelangelo. These two giants were his true spiritual heirs. In 1300, the wealthy Paduan merchant Enrico Scrovegni bought a piece of land on the site of a former Roman arena. Included in the palace that he built on the site was a chapel dedicated to the Virgin of the Annunciation, Santa Maria Annunziata, and the Virgin of Charity, Santa Maria del Carità. Enrico is shown in the fresco of the Last Judgement presenting a model of the chapel to the Virgin. The family wealth had been amassed by Enrico's father, Reginaldo, whom Dante singled out as the arch usurer in his Inferno. Usury, the lending of money for profit, was considered a sin during the Middle Ages. 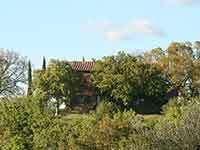 It is likely that Enrico constructed the chapel as a means to expiate the father's sin. The dedication of the Chapel to the Virgin of Charity, referred to in a document of March of 1304 in which Pope Benedict XI granted indulgences to those who visited "Santa Maria del Carità de Arena," was an obvious choice to disassociate the family from taint of greed and miserliness. The theme of usury is developed in a number of frescoes in the Arena Chapel. This is most evident in the prominent positioning of the scene of Judas being paid for betraying Christ on the north side of the Chancel Arch adjacent to the altar. But the theme of usury is also developed in the adjacent image of Christ expelling the merchants from the Temple and the detail of usurers hanging from the their money bags in the Hell scene included in the Last Judgment. "Among the factors that relate specifically to Enrico Scrovegni are a possible desire to expiate his father's usury and at the same time to make his own expenditure conspicuous; an ambition for status combined with a fear of damnation; a desire, on the one hand, to be regarded as an ascetic devoted to the cult of the Virgin, and, on the other, to secure for himself a fitting property to serve as his personal monument (Source:Diana Norman, Siena, Florence, and Padua: Art, Society and Religion 1280-1400, Volumr II: Case Studies, p. 92)." It is likely that the Chapel was formally consecrated on March 25, 1305, the Feast of the Annunciation. An entry in the records for March 16,1305 of the High Council of Venice documents the lending of tapestries to Enrico Scrovegni on the occasion of the dedication of his chapel. The earliest reference to Giotto's frescoes in the Arena Chapel is found in an allegorical poem entitled The Documents of Love written by Francesco da Barberino between 1308-1313. The text refers to a figure of Envy that "Giotto painted excellently in the Arena at Padua. This article incorporates material from the Wikipedia article Giotto published under the GNU Free Documentation License. Wikimedia Commons contiene file multimediali su Giotto.